The decision to consider euthanasia can be one of the most challenging decisions you may have to make in life. It can also be one of the kindest decisions for your pet. It is usually not easy to determine when is the right time. The decision varies greatly based on the pet and their care givers. What is the right time for you may not be the same for another. Our veterinarians can help you work through this process. There are also links below that can help you in making that decision. The euthanasia process begins with a sedative injection first. Once the pet has become peaceful a second injection is given. This will stop the brain and the pet will fall asleep and his or her heart will stop. You can opt to be present for all, none or part of the procedure. A clay paw print will be made and a locket of fur will be given to take home. 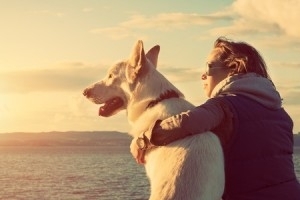 Pets are family to us, and when we lose a family member, we go through a process of grieving. To help with your grieving, here are some resources and links to help you find counselors, support groups, discussion forums, and other support options. www.www.pet-loss.net – Pet Loss Support Pages: This website, maintained by Moira Allen, includes state-by-state listings of pet loss services. A variety of other information about end of life issues, euthanasia, and coping with pet loss can also be printed from this site. www.chancesspot.org: Pet loss support forums, pet grief and bereavement hotline numbers, helpful information about pet loss, and an online pet tributes and memorials page where pet caregivers can say goodbye to pets who have crossed the Rainbow Bridge are just some of the resources available at the Chance’s Spot website. www.aplb.org: The Association for Pet Loss and Bereavement (APLB) maintains a national clearinghouse of information on pet bereavement, including a counselor-facilitated chat room. www.rainbowbridge.com: Rainbow Bridge website provides a “virtual interactive” memorial page, a pet loss forum, and links to other pet loss websites. Click here to learn about BioUrn.